I'm a little overdue for a new post. I got a bit of a cold at the end of January (good thing I was eating so cleanly or I think it would have been much worse than it was) and it gave me an excuse to be extra lazy for the last week. I'm pretty much better, so no more excuses. Or, as Fidel, the Cuban dishwasher I worked with years ago in a macrobiotic vegan restaurant used to say, "No eh-cuses! NO MAS!" Now that my Whole30/Paleo challenge is up, I'm having challenge withdrawal. It went pretty well and I think it's time for a new challenge (maybe I'll just keep coming up with a new monthly challenge for the rest of my life. That could be interesting...) So, now that my diet is improved, the next thing that could use some improving are my sleep habits. I think I was born night owl. As a kid, I never woke up at the crack of dawn like my younger brother did and I remember often playing in the dark in my room (or reading De. Seuss books by the light from the hall) when I was supposed to be sleeping. Can a night owl become a lark (or at least a robin?) Can we reprogram our sleep preferences? I sure hope so! In the past I've had jobs that started at 7am and I lived in a perpetual state of sleep deprivation, since I could never discipline myself to be in bed on time (I wasn't a coffee drinker, so I can't believe I even managed!) I was in my early 20's then; my body would NEVER let me get away with that crap now! All those years of inadequate sleep didn't do me any favors and set me up for adrenal fatigue. In my younger days, despite my lack of sleep, I had no sleep issues. Then, in my mid-late twenties, I developed insomnia, where I would wake up repeatedly throughout the night or just once but not be able to fall back asleep for hours. I tried a lot of things, but in the end, acupuncture and blackout shades were what worked (there was way too much light coming in through my windows, which really disrupts melatonin production). Slow Wave Sleep: The final stages of non-REM sleep, Slow Wave or Deep sleep, are marked by very low heart and respiratory rate, extremely slow brain waves and a complete lack of eye movement or muscle activity. Arousal from slow wave sleep is difficult and can result in disorientation and confusion. Slow wave sleep allows the body to direct its resources to regenerate tissues, build bones and muscle, recharge energy stores and strengthen the immune system. Although REM sleep is vital to healthy brain function, including memory and task performance, spending too much time in it and too little time in slow wave makes you feel like you've been out partying all night long (can you say "vivid dreams all night long"??) and you end up feeling like you've been hit by a truck when you get up in the morning! You need that slow wave sleep for tissue repair and good hormone production. -earlier bedtimes (like, by 10:30). -shutting the laptop off earlier in the evening (by 8:30) and turning the lights down. - getting natural light first thing in the morning. -drinking mineral rich, nervous system supporting teas like nettle, oatstraw, rooibos, chamomile and horsetail throughout the day and evening. -keeping caffeine minimal and only consuming it before noon (caffeine has a half life of at least 6 hours- and much longer if your liver is slow at clearing it- which means that the afternoon cup of coffee is still in your system in the evening, albeit at half strength, but that's enough to affect sleep quality. -getting consistent moderate aerobic exercise (for me, brisk walking), which improves sleep. I'll join you. Now that the little cherub is going to bed earlier and (usually) sleeping through the night, I need to start trying to get more sleep myself. I'm so bad about staying up late on the computer. Going to try and be better about that. It's not been easy getting myself to bed earlier and sometimes it still takes me quite awhile to fall asleep. I tried some herbal sleeping aids and it seems like they ramp up the dreaming even more. Not good. Last night I chose not to take them, which was a flop (since I didn't fall asleep till nearly 1:30) but I'm pretty sure hormones had something to do with it. I'm just going to keep on trying! If I am don't feel myself winding down fast enough at the end of the day I usually do a few body weight exercises. Take about ten minutes or so and do one set of hindu pushups and hindu squats to exhaustion. Then hold a basic planche for as long as you can. It does up your heart rate a bit but after about 30 to 45 minutes you should be pretty relaxed and in a better place to try and sleep. Given that we are all weirdos in our own right I find that playing youtube videos of people with a soft relaxing voice puts me to sleep. I just turn the screen off and have it go to sleep after about 20 minutes so it doesn't run all night. Hello! I just stumbled upon your blog. You have some great stuff. I too have sleep problems--I get wired at night and stay up too late. I think it's a great battleplan you've mapped out. Good luck! @Dan- thanks for the tips! @Freshman15- thanks for the compliment! Hi there, I actually live in España, and the siesta is something that has pretty much disappeared except on the weekends. I´ve lived here for over 10 years and always had to work during typical siesta time, from 2pm to 4 or 5pm. People also tend to sleep about an hour less on average than other countries in Europe. 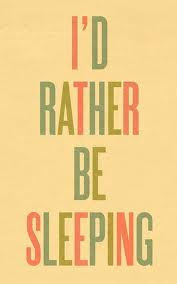 I will try to join you on the sleep challenge, it seems like getting up at 5am is what sends me to bed by 10pm. That's so sad about the disappearing siesta! Is it like that all over Spain or just in the metropolitan areas? How much do people in Europe sleep on average? I'm always appalled at how many people I hear of in the US who only sleep 5-6 hours/night. I seem to need about 9 hours. I've read that in the late 1800's people slept an average of 9.5 hours. They didn't have all the artificial light we have, so I'm sure that made a big difference.